Mike Martin's superior talent and production are not lost on Michigan's coaches, nor is it on opposing offenses. As such, Martin has faced constant double teams to avoid his potential impact. Michigan coaches know that Martin is integral to the defense's success and have deployed a few different methods in the last two weeks to try and get him free. Against Indiana, Greg Robinson moved Martin to the defensive end spot in four-man fronts and put Ryan Van Bergen at the defensive tackle spot. It had middling results. 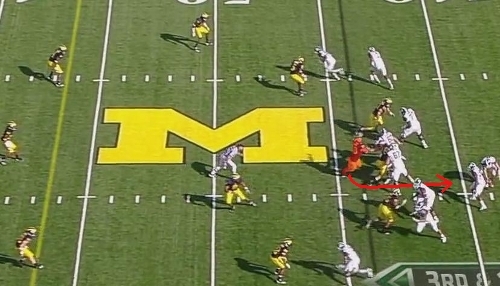 Against MSU, Robinson showed a wonderful blitz/stunt combination that got Martin a free release at Kirk Cousins. Roh is highlighted in red here. 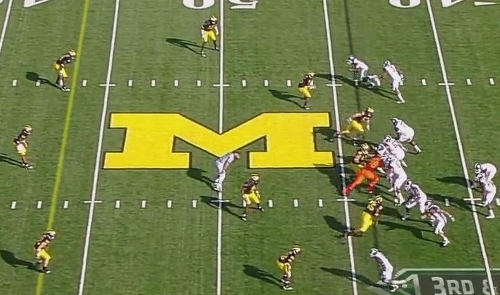 You can see him slanting into the offensive guard and center. 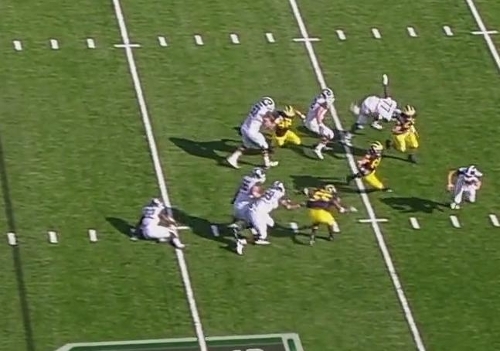 Jibreel Black is rushing on the outside on the bottom of this picture, leaving a hole between the left guard and left tackle. Mike Martin is beginning a stunt (essentially when he and Roh crisscross on a blitz) that will lead him through the gap that Roh's blitz created. Now it's Martin highlighted in red. Roh has buried himself in the offensive line and drawn the attention of the left guard and the center. You can see the gap that has been vacated by the left tackle and left guard that Martin is stunting into. Martin grabs Caper and throws him into the right guard who was in pursuit. Martin now has a free rush at Cousins who is also feeling the pressure of Black and Ryan Van Bergen off the edges. 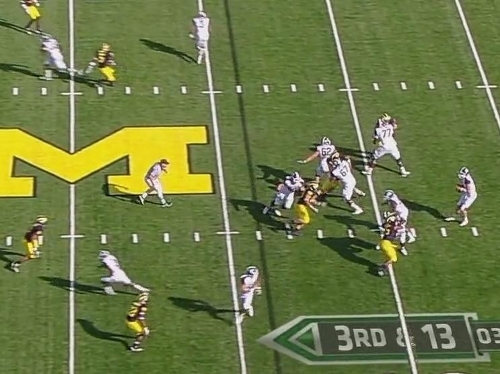 Cousins breaks contain and starts rolling to his left, but Michigan has good coverage down the field (and in front of Cousins, preventing a scramble) and is forced to throw the ball away. This play obviously won't work this well every time, but it's clear that getting Martin free of double teams is a priority for the coaches. 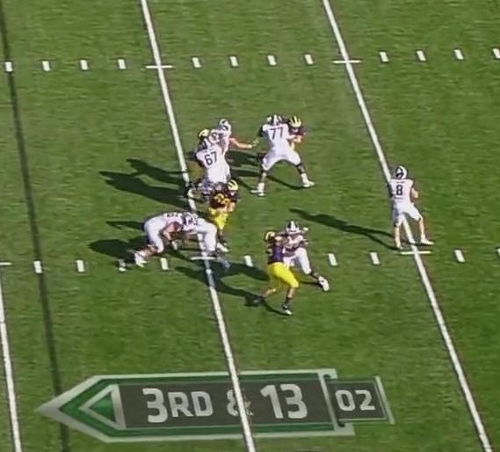 I've been down on Greg Robinson in the last two weeks, but plays like this and his move toward more man coverage make me think he's not hopeless. 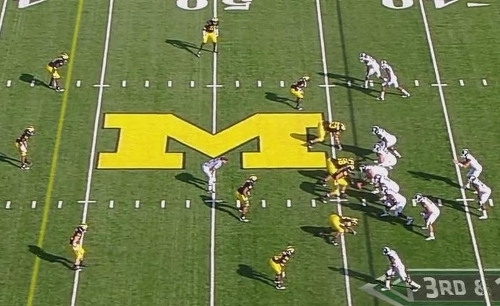 This is a really well designed play. Martin is far and away the most talented player on Michigan's defense, playing a position that typically sees the bare minimum of stat-sheet production. 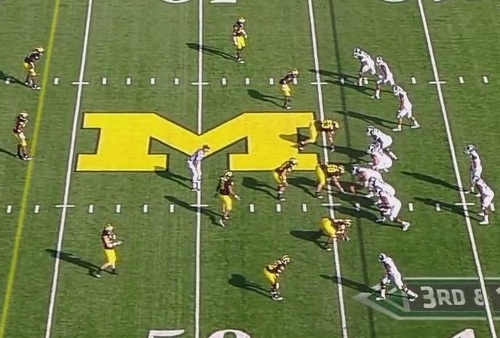 Getting him free rushes like this more often is another way the defense will be able be more effective.